TITUS CORLĂŢEAN, Minister of Foreign Affairs of Romania, strongly condemned the recent attacks in Benghazi and said attacks against diplomatic representatives were unacceptable in any circumstances. Perpetrators must be brought to justice through fair, equitable trials. The ideals of democracy must be pursued and stability and the rule of law should be the future pillars of society in Libya and elsewhere. Romania was firmly committed to supporting international efforts to consolidate stability, security, tolerance and religious understanding. In Syria, the Government must comply with its international human rights commitments and obligations. Justice must be done in all cases of human rights violations and all perpetrators must face a fair trial. The international community must curb the escalating violence in Syria, and he supported full implementation of the Six-Point Proposal. All Syrians irrespective of religion or ethnicity, must be a part of Syria in the future, and everyone must help the Syrian people heal the scars of violence. He called for a more structured United Nations response and a consensual approach by the Council to the Syrian crisis. Violence could not be allowed to prevail when Syria’s people were relying on the international community’s ability to offer stability and predictability and when regional security and stability were at stake. The severe humanitarian crisis in Syria deserved the world’s undivided attention. Romania was contributing to global efforts to alleviate the pain and suffering of innocent people. In other areas affecting peace and security, there had been little room for optimism. Romania strongly supported all efforts to achieve a comprehensive peace in the Middle East, including the Quartet’s initiatives and the Israel-Palestine, two-State solution. Unilateral action was inappropriate and would have a detrimental effect on the resumption of direct negotiations and it would obstruct a final solution to the Israeli-Arab conflict. He was also concerned about the lack of progress in negotiating solutions to “protracted conflicts” in the Black Sea region, including the Transdniestrian and Nagorny-Karabakh conflicts and the one in Georgia involving Abkhazia and South Ossetia. He called for more attention to resolve them and lauded efforts by the United Nations, European Union and the OSCE towards that end. Much remained to be done to ensure the principles of human security, the responsibility to protect and mediation were operational. Romania was ready to work towards that end. Based on his experience as the former Chairman of the Senate’s Foreign Affairs Committee, he believed the role of parliaments could be bolstered to prevent disputes and settle existing ones. Cooperation and interaction among the United Nations, national parliaments and the Inter-Parliamentary Union in peacebuilding was highly relevant. He commended the efforts of the Parliamentary Assemblies of the OSCE and Council of Europe to promote security, help settle protracted contracts and support respect for human rights, democratic transition and the rule of law. 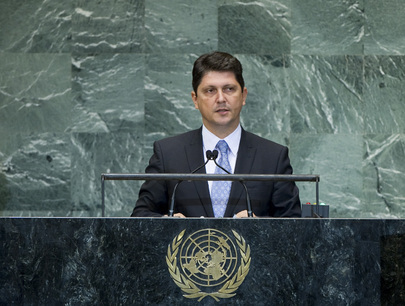 In the last 15 years, Romania had made important contributions to civilian and military United Nations missions and it had begun to assist in post-conflict reconstruction, he said. National and international banking and financial institutions increasingly should become a partner to Governments to resolve economic crises. More attention must be paid to combat youth unemployment. Youth needed universal access to education and professional training. Climate change must be addressed comprehensively. Water, the planet’s most precious resource, must not be allowed to become the planet’s most disputed resource and a source of bitter conflict. Romania had contributed to development of the Human Rights Council’s working methods. That body’s Universal Periodic Review was an appropriate instrument to implement protection of human rights. He called on the Assembly to adopt a resolution similar to the one passed in the spring by the Human Rights Council on human rights, democracy and the state of human rights.